Eating out is taking on a new flavour this spring and summer at Auckland Castle. Special celebratory afternoon teas, a refreshed café menu and a series of seasonally-inspired pop-up restaurants, are among the tasty treats being served up to thrill the palates of discerning diners. It will be mums who will be made to feel extra special on March 15 at the former palace home of England’s only Prince Bishop at Bishop Auckland, County Durham, as Mothering Sunday is marked with an extravagant afternoon tea. Served in the Grade 1 listed castle’s Library Tea Room, it will feature an array of savouries, scones, and sweet treats. Among the delicacies on offer will be cucumber sandwiches with a mint yoghurt dressing served on homemade bread; smoked salmon tortilla; mini chicken pie with castle chutney; lemon and coconut cheesecake; lemon and ginger posset; and rhubarb and custard marshmallows. The Mother’s Day Afternoon Tea costs £14.50 per person and pre-booking is essential. 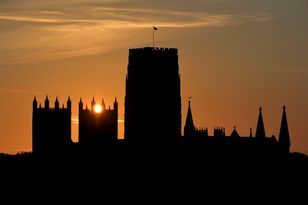 March will also see Auckland Castle opening its doors after hours for the first in a run of monthly pop-up restaurants. The one-night only dining events scheduled for the last Saturday of every month, will see the castle’s head chef, Luke Orwin, serving up the finest seasonal food, with many of the ingredients travelling just yards from plot to plate. Luke, 22, who has worked with some of the North East’s top chefs, says: “In season I’ll be making the most of the fresh produce grown here at the castle and harvested at its best. “We already use as many local ingredients as possible on the tea room menu and home make everything from the bread to the biscuits, cakes, jams and chutneys. The first pop-up on March 28 will offer a five-course tasting menu at £32.50 per person, with fizz and nibbles on arrival; Jerusalem artichoke, lemon and chervil crème fraiche soup with crispy croutons; smoked haddock dippy egg with potato bread soldiers and curried mayonnaise; herb crusted pork fillet; and rhubarb and custard. Dates for the following pop-ups include April 25, May 23 and June 18, which will be a special summer food and wine pairing at £45 per person. It will be hosted by Richard Bouglet of wine merchant L’Art du Vin, which supplies the Michelin star Raby Hunt restaurant at Summerhouse, near Darlington. Weather permitting, it is hoped to hold a picnic-style meal outdoors in Auckland Castle’s grounds. Charlotte Walton, Auckland Castle’s catering manager, said: “We haven’t finalised the food yet, but it will be a five-course summer-inspired menu with salads and seafood and probably a barbecue-style dish matched with lighter, crisper white and rose wines. The Library Tea Room menu has also been given a new season look. The popular soup of the day with freshly baked bread remains but has been joined by new dishes such as North Sea fish cassoulet with garlic and cheese croutons; Moroccan spiced chickpea stew with a spinach, date and almond salad; bacon and duck egg pie; and a Library club sandwich consisting of garlic chicken, baby gem lettuce, chutney and mature cheddar. These dishes sit alongside a selection of homemade scones, biscuits and cakes.